Are you craving a hearty bowl of soup but don’t want to spend all day in the kitchen? Instant Pot Chicken Noodle Soup is done in a snap. It’s easily made and oh so delicious. Chicken Soup is a classic, comforting meal that your whole family will enjoy. 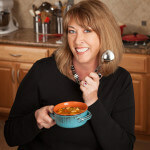 Hey it’s Deb again from Bowl Me Over – I stopped by to share another delicious meal, everyone’s favorite and most popular soup, Chicken Noodle! This recipe is made in your Instant Pot – what?…. No Instant Pot? No problem! 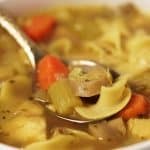 I also have a recipe for Chicken Noodle Soup on my blog that is made on the stovetop and only takes 20 minutes to make. Is the weather still super cold where you are? It’s been chilly here, but I do live in Fresno so that’s all relative, right? Cold here is the 50’s, but it’s still bright and sunshiny. We’ve really had no winter to speak of and only 1 1/2 inches of rain. It will be a hot and dry summer I’m sure, but in the meantime while it’s still winter… we’ll talk soup! 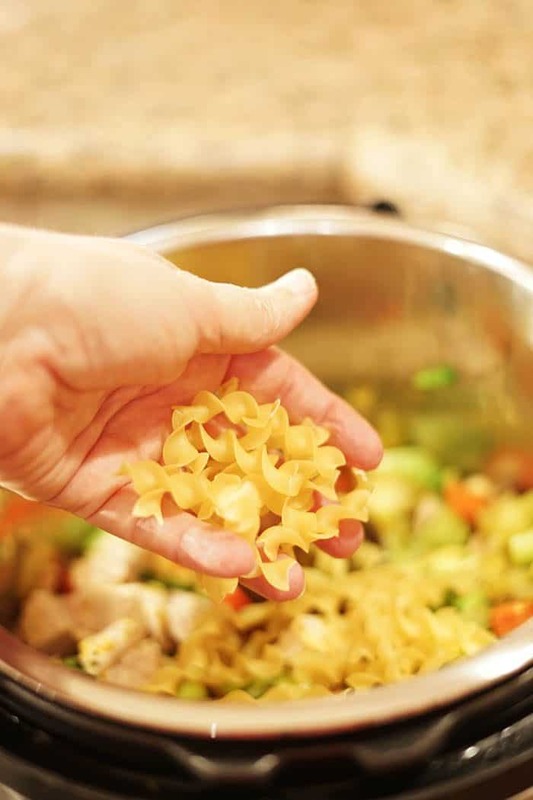 Instant Pot Chicken Noodle Soup takes just a bit of cleaning and chopping vegetables. 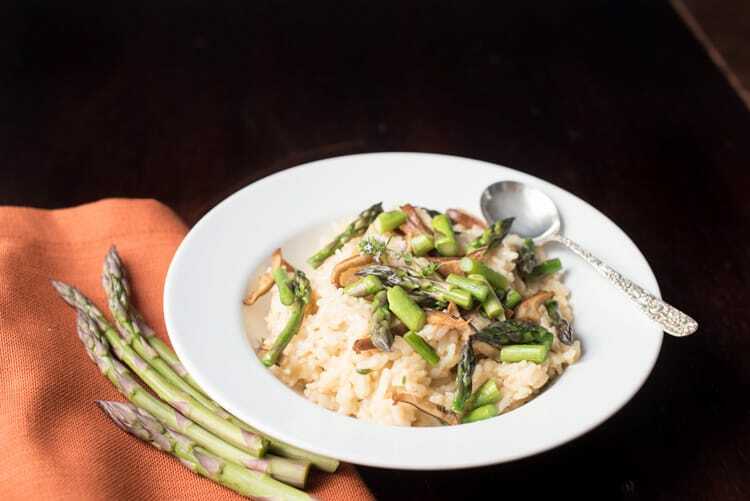 If you don’t have the vegetables from the recipe below, substitute with your favorites – green beans, zucchini, chopped cabbage instead of Brussels sprouts, but load it up with veggies and make this a hearty meal! Use a rotisserie chicken for the cooked chicken so there’s no extra cooking. Next you’ll toss in a handful of noodles. And because this soup is done in a snap, some rotisserie chicken and chicken stock. On goes the lid. Set the valve to seal and manually set the timer to 3 minutes and let the Instant Pot do all the work! When the timer goes off do a quick release and the soup will be done. Yup! That simple and that delicious! Want to take your instant pot chicken noodle soup to the next level? 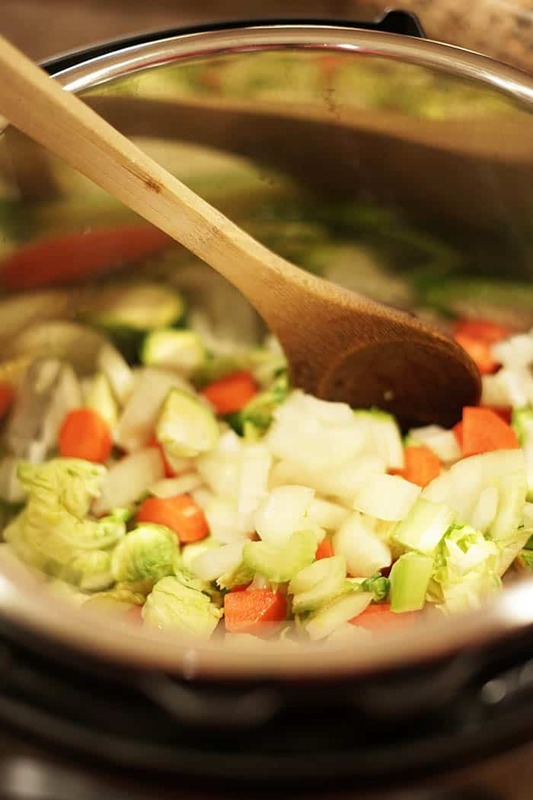 Be sure to cut the vegetables uniformly – that way all of the vegetables will cook evenly and fit on one spoon. Adding a squeeze of lemon and a handful of chopped parsley will brighten the flavors of your soup, making your homemade meal even more delicious! I hope you really enjoy this meal! If you are looking for more chicken soup recipes, come join me on the blog! There are plenty more easy and delicious soups like Lemon Chicken Orzo Soup (amazing!) or a super easy Chicken and Dumpling Soup! 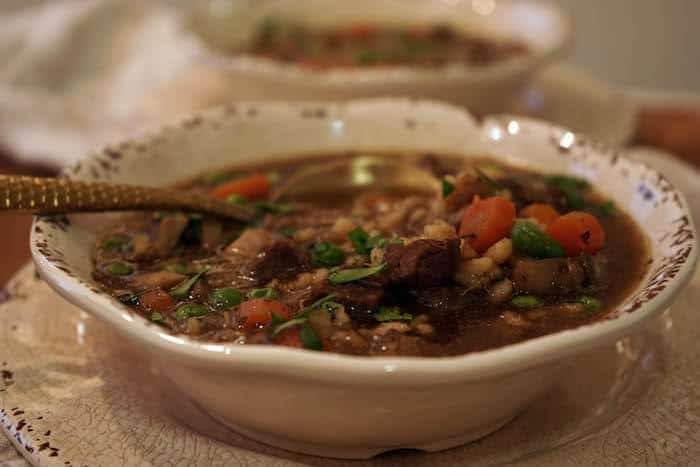 Better yet, just click on this link and it will bring up a list of amazing Soups for you and your family to enjoy! 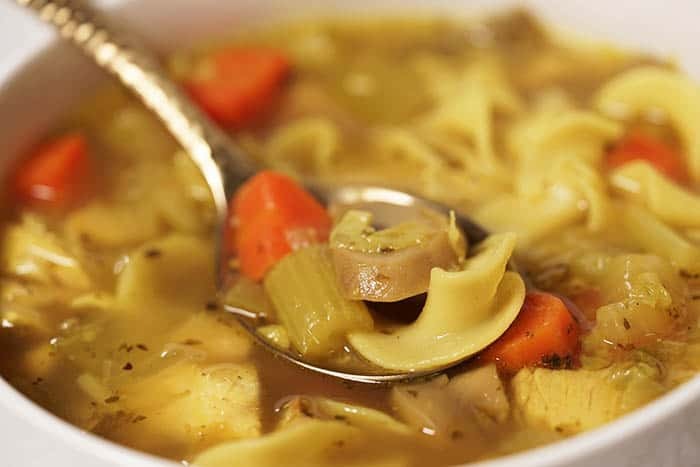 Instant Pot Chicken Noodle Soup is a hearty bowl of soup that won’t take you all day in the kitchen! It’s done in a snap, easily made and oh so delicious. Chicken Soup is a classic, comforting meal that your whole family will enjoy. 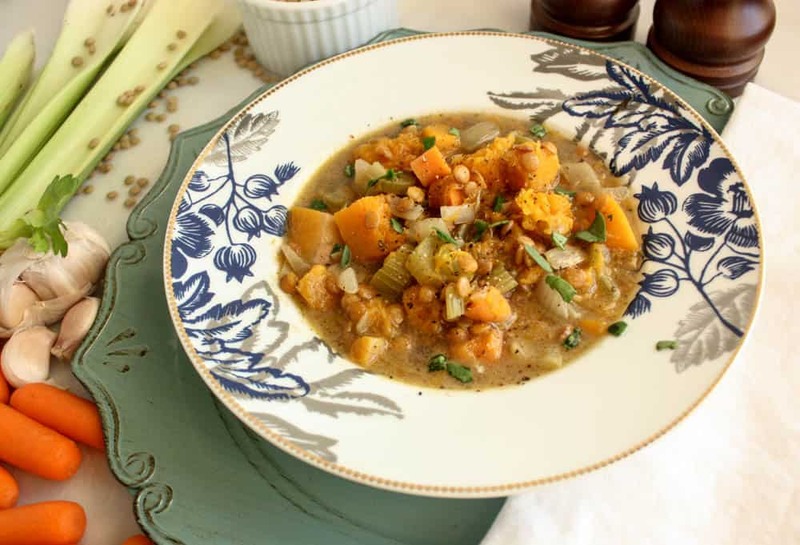 Are you craving a hearty bowl of soup but don't want to spend all day in the kitchen? 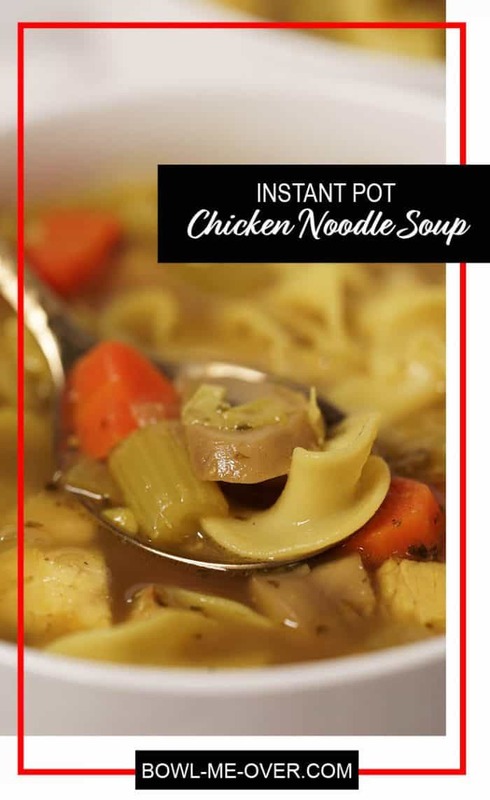 Instant Pot Chicken Noodle Soup is done in a snap. It's easily made and oh so delicious. Chicken Soup is a classic, comforting meal that your whole family will enjoy. Dice the bacon add to the Instant Pot turn on sauté. Sauté the bacon until crispy. Drain the excess oil from the pan. Keep the bacon in the pan. While the bacon is frying, prepare the vegetables - Peel and dice the onion and carrots. Clean the Brussels sprouts, quarter the Brussels sprouts. Dice the celery and red pepper. Slice the mushrooms and mince the garlic. Add the chopped vegetables to the Instant Pot along with the bacon. Onions, carrots, celery, mushrooms, bell pepper and Brussels sprouts. Add the salt, black and red pepper. Sauté for 3 minutes. After 3 minutes, add the garlic and sauté for another 30 seconds. Add the cooked chicken, noodles and stock. Stir well and seal. Change setting to manual and set the timer to three minutes. After the timer is done, do a quick release. After all of the steam has escaped, remove the lid. Stir in the frozen peas (the heat from the soup will cook them thru). Add in the parsley & lemon juice if using. Stir and serve. Enjoy this soup! 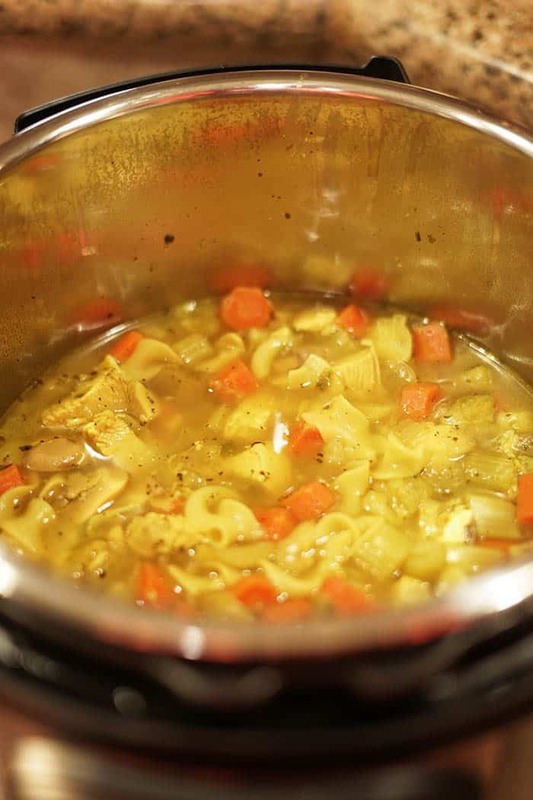 If you liked this instant pot chicken noodle soup recipe you might also like…. From left to right: Instant Pot Beef Barley Soup, Instant Pot Asparagus Risotto & Lentil & Butternut Squash Soup.